We came through this gate on Saturday. On Sunday it was locked. No other way out. Are you kidding me??? Our camper, and that of our new friend Tom, on the wrong side of a locked gate that was definitely OPEN when we came in. 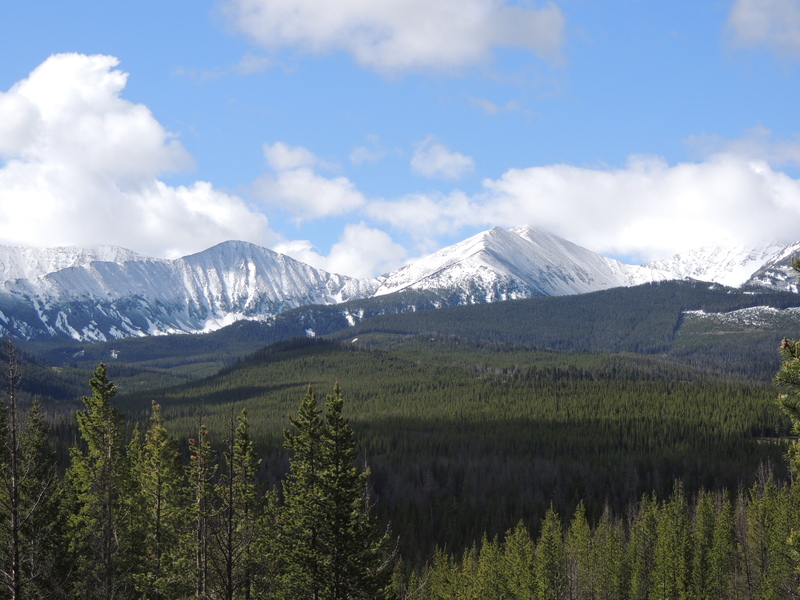 I am generally just fine with the Forest Service. I haven’t always agreed with their decisions, but I think they do a pretty good job of balancing the competing needs and wants of public land users. BUT when I’m stuck behind a locked gate, on a road that that their own website says should be open, you can trust that they are on the receiving end of plenty of cussing. We arrived at the Forest boundary around 6:00, in the rain. We obviously went through an open gate, but we didn’t even notice it. The campground is about three miles in, and it really is a lovely spot. Only one other camper was there. We even managed to fit in a nice little walk between rainshowers. The next morning we explored and bit more, and then planned to head into the little town of Wilsall for the rodeo. Good plan, except that we couldn’t get out. When we got to what had been an open gate, it was closed. And locked. The other pickup was parked there, but nobody was around. Of course, no cell service. We decided to start walking to see if we could get service (although I’m not sure who we were planning to call; do you think there would have been any way to reach the Forest Service on a Sunday?) We did meet a nice couple of women driving up the road, and they said that they’d do their best to get someone to help us when they got back to town. 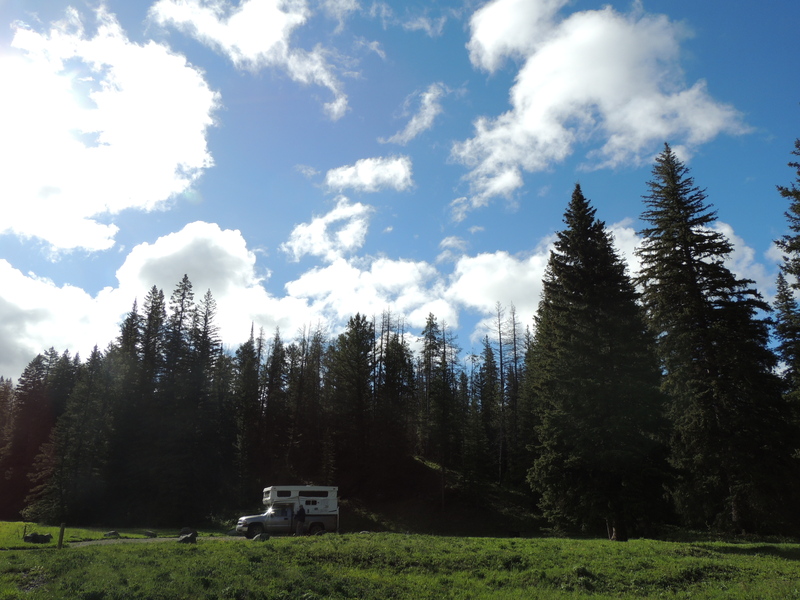 We also ran into the other camper, who had arrived at the locked gate at 7:30 that morning. He’d walked a couple of miles further and still couldn’t get a signal, but he had also spoken to someone who said they’d work on getting someone out there. The three of us popped up our campers and ended up having a nice visit. Tom was just beginning a 5 week trip to Alaska, and we got some great tips on doing that sometime in the future. We were in a pretty spot, had food and water and heat — could be worse. Overnight at a locked gate? OK …. if we have to. After about an hour, another pickup came up behind us. Someone else was up there? To our surprise, he worked for a rancher up the road, and he had the combination to the lock! 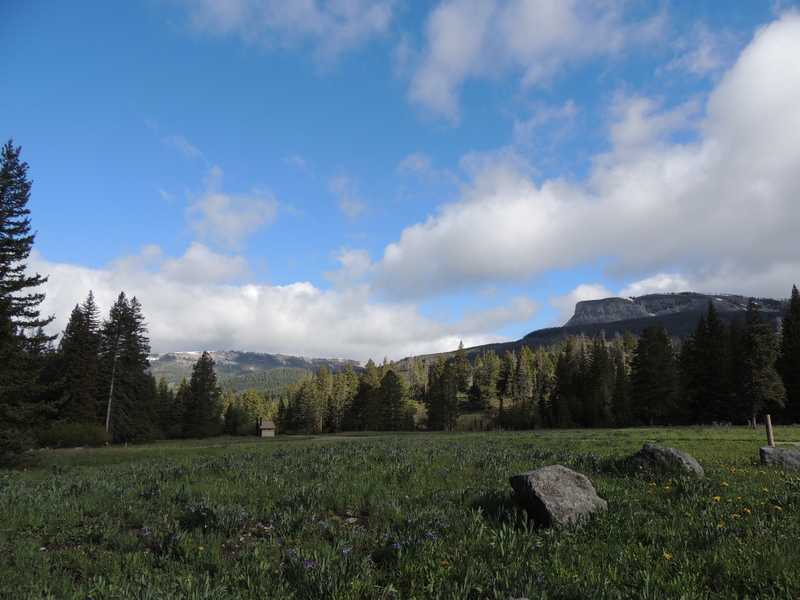 He said that there were a number of people who ranched along there, and the forest service gave them the combination. One of them must have left the gate open on Saturday and then closed it when he left. I asked why the gate was locked anyway, since the campground had been open since Memorial Day. He said no, the campground and the road wouldn’t be open until June 16. What?? He guessed that the website must be wrong. Geez. What kind of harebrained operation is this? First, get the website right. Second, if you want to put a gate across a public road, don’t go giving out the combination to who knows how many people, and then act surprised when the system gets screwed up. Because yes, when I called the Forest Service today to tell them about this, they seemed perfectly willing to blame this on “someone who had the combination.” They were contrite about the misinformation on the website, at least. Despite our misadventure, it was a beautiful spot to camp, so if you end up in the Shields River Valley (after June 15!) I’d recommend checking it out. 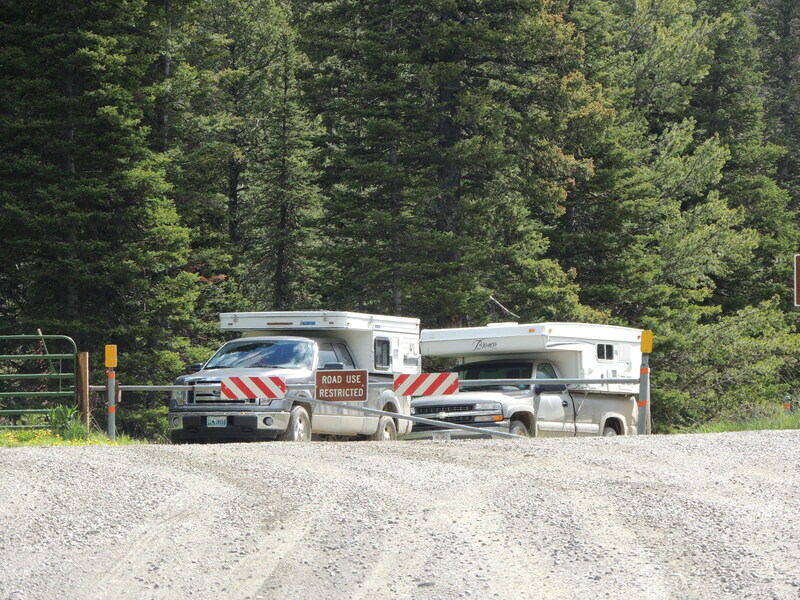 This entry was posted in Adventure, Camping, Life, Montana, Nature, Outdoors and tagged Forest Service messup, Shields River Campground, Stranded behind a locked gate, will we ever get out?. Bookmark the permalink. 13 Responses to Really Forest Service? You’re Locking Us IN???? That is frustrating! Either keep the website up to date or get rid of it. What if you’d had an emergency medical situation. That’s more than a little worrying! I know! My blood pressure goes up every time I think about it. Always have bolt cutters in your rig! Yep – we were saying just that. Actually, I’d just said that we needed to put the little chainsaw back in the truck so that we could get out if a tree blocked the road. I don’t suppose you can chainsaw your way through metal, can you? Can I mention the V.A. and Obamacare and let you draw your own conclusions? Still not enough to turn me Republican, Mr. Holmes! I’ve seen plenty of harebrained operations in the private sector, too. You’re right, it IS beautiful. I had a similar experience in Yosemite. However, when the road closed due to weather, the Rangers left a note on my car telling me of the closure and the combination to unlock the gate. They also asked me to relock it. I saved the note. But the locked gate. Crazy. You have every right to be upset.